A complete listing of individual tiles is available. 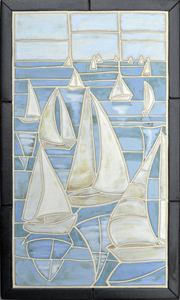 The Sailboats Mural and other murals can be found at the Small Murals page. Ceramic stoneware tile is a beautiful and permanent way to recognize donor gifts. Download examples to see how you can use tile to help achieve your fundraising goals. A tile brochure is available for download. A new flyer for Handmade Address Tiles is also available.